Mahamudra (Skt. Mahāmudrā; Tib. ཕྱག་རྒྱ་ཆེན་པོ་, Chakgya Chenpo, Wyl. phyag rgya chen po), or ‘Great Seal’ is the meditation tradition of the Kagyü lineage which passed from Maitripa and Naropa in India to Marpa Lotsawa in Tibet. It is also practised in the other schools of Tibetan Buddhism. Mudra means that it encompasses all phenomena of samsara, nirvana, and the path. In other words, they are 'sealed' within it. It is called maha or “great,” because nothing is superior to it. Mahamudra of the sutra system refers to the attainment of perfect enlightenment through the five paths and ten bhumis. Tantric Mahamudra is related to the inner yogas and the practice of dzogrim. Essence Mahamudra (Tib. ངོ་བོའི་ཕྱག་རྒྱ་ཆེན་པོ་, Wyl. ngo bo'i phyag rgya chenpo) is closer to Dzogchen and is described in terms of a meditative practice leading to the nature of mind. 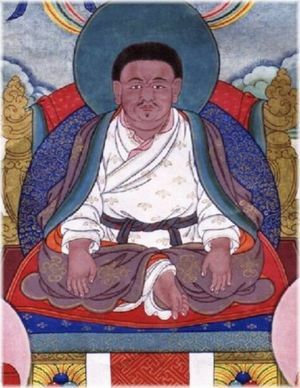 Jamgön Kongtrul said that Mahamudra corresponds to the Semdé teachings of Dzogpachenpo. Dakpo Tashi Namgyal, Mahamudra, The Moonlight: Quintessence of Mind and Meditation, translated by Lobsang P. Lhalungpa, Wisdom Publications, 2nd ed. 2006. Kalu Rinpoche, The Union of Mahamudra and Dzogchen, Khyentse Özer, Rigpa, London, 1990. Khenchen Thrangu Rinpoche, Crystal Clear: Practical Advice for Mahamudra Meditators, translated by Erik Pema Kunsang, Ragjung Yeshe, 2004. Tsele Natsok Rangdrol, Lamp of Mahamudra, Shambhala, 1989. This page was last edited on 21 March 2018, at 21:15.